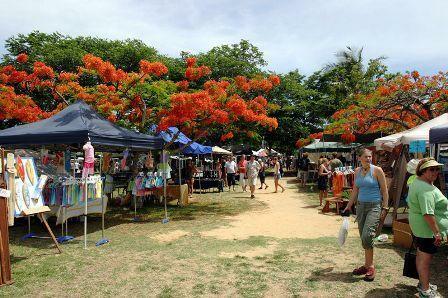 Held each Sunday morning on the Anzac Park waterfront, the Port Douglas Markets are a local institution and a must see attraction when visiting Port Douglas. Having been operated for more than 20 years, the Port Douglas Markets are a ritual for locals and visitors alike and offer more than 100 stalls drawing huge crowds from 8 am to 1.30 pm. With no better way to enjoy your Sunday morning, the Port Douglas Markets offer locally grown produce, delicate handicrafts, artwork, handmade furniture, stunning jewellery, toys and knick knacks and enjoy a wonderful atmosphere thanks to the many buskers and street performers that create a colourful ambiance. No other Australian market has a backdrop as beautiful as the Port Douglas Markets making it a must see attraction even for those who don't like to shop til they drop. If enjoying the view is more your cup of tea, then you can do so while having a cup of tea and taking in Wharf Street, Dickson Inlet, the Coral Sea and the spectacular mountain ranges. 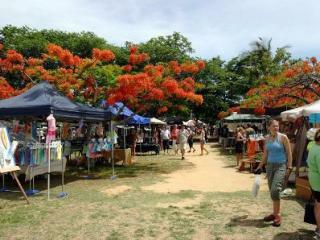 Compared to other markets, the Port Douglas Markets are unique in that since 1998 it has been a 'Cotters' market, meaning any item sold must be locally made or grown by local residents or their immediate family. This ensures that there will never be anything mass produced for sale at the markets and in most cases, each piece will be unique, one-of-a-kind or one of very few. Stalls begin setting up at sunrise to greet the early Sunday shoppers with their culinary and creative skills, making the Port Douglas Markets a favourite gathering place for both locals and tourists alike. Immerse yourself in the colourful north Queensland culture and experience this must see Port Douglas attraction on your next visit to the tropics.